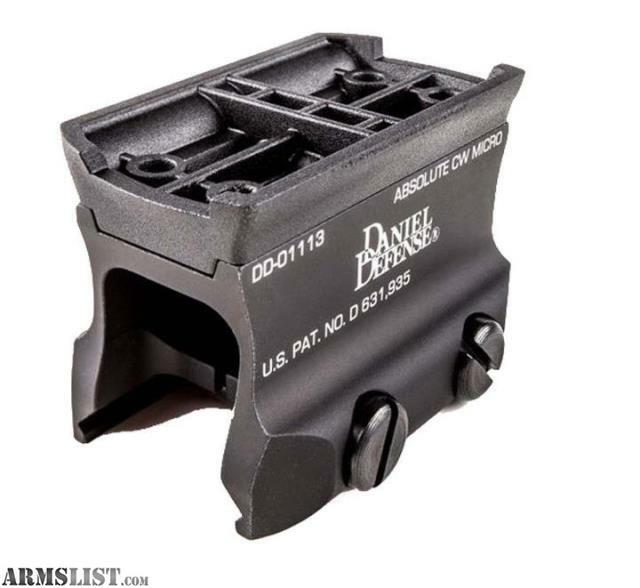 The Daniel Defense Micro Mount is designed to securely mount a variety of popular optics to your flat-top upper receiver including Aimpoint’s Micro R-1, H-1, T-1, Vortex’s Sparc I & II, Primary Arms’ Micro Dot & Advanced Micro Dot, Holosun Technologies HS403, or any other optic utilizing the same type of mounting interface. Offering Absolute or a Lower 1/3rd Co-Witness with your back-up iron sights, this mount is ideal for shooters who are looking for one of the lightest and strongest mounts available to secure their optics. Its lightweight, essentials only design offers a snag-free, low-profile, reversible mounting option for shooters that do not require or desire a quick attach/detach mount. The mount features a recoil lug that minimizes sheer forces on the factory mounting screws. The Micro Mount features the Rock & Lock Attachment System and secures to any MIL-STD-1913 Picatinny Rail with two slotted machine screws. These fasteners thread into stainless steel self-locking threaded inserts that resist vibration and loosening. Machined from 6061-T6 aircraft grade aluminum and Military Specification Hard Coat Anodized, the Micro Mount is both lightweight and durable.